MERRY CHRISTMAS!!! I am doing awesome I miss you guys so much. But I stay busy enough that it doesn't get to me. Uncle Sterling has gone through a lot in his life and he has always been able to pull through, but I'm sure this is one of the hardest things or maybe the hardest thing that's happened to him in his life, but as he has in the past, he will pull through. I know that he can. But I will always keep him in my prayers. OH BTW Josh Thomas got his mission call to Lansing, Michigan. That is so awesome! The missionary work has slowed down a little bit. It's just really hard to get a lesson with people because everyone is so busy. This last couple of weeks we have had the chance to go out caroling with brother Brooks, our ward mission leader, and a bunch of members in our ward. We went around to non-member homes that the ward members selected and sang. After the first verse of Silent Night, one of us stepped forward and bore our testimony of the Gospel, and alot of people accepted our invitation to learn, but not until after the Christmas season. It is quite difficult to get people to church. A lot of it comes back to how well you teach, and I'm still working on getting better. Australians really aren't that receptive to missionaries, because most are American, and they dont really like Americans, but yes, usually if they accept to learn, they are very serious about it. How did grandma brown hurt herself? I think it's (Jared's anger difficulties) something to do with the fact that its starting to really hit Jared that I am not there. It's a great change in the Christmas time. oh, Btw, Christmas zone conference was alot of fun. I love you so much and am so thankful for your love for me. P.S. could I get a recipe sent to me for mom's peanut butter bars. I havent opened the package yet. I love my new area in richmond it is so awesome the ward is so focused on missionary work. 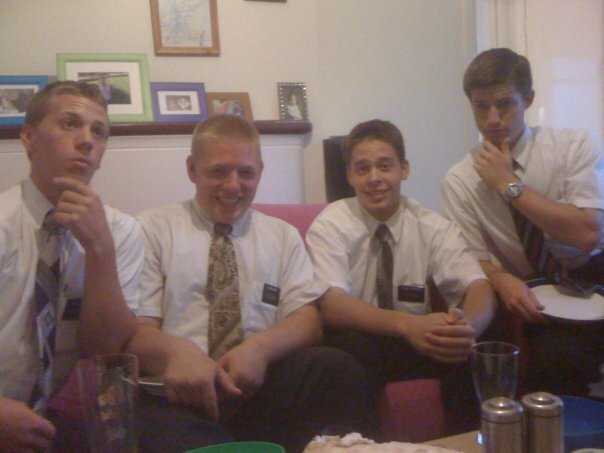 Elder Bennett is awesome. He is a legend, and he is probably my favorite companion so far in my mission. I got the package but I havent opened it yet. I have 3 members that I am spending Christmas at. 2 of the families are the Pauna families and then the Wilcox as well. It will be awesome! I cant wait to talk to you either. I get to talk for 80 minutes! My companion is awesome! I still think you are a nerd, but thats ok :) Got to go. Ya I cant believe I got transferred, but I'm over it because my new area is so awesome I will have to send you some pictures when I get more. This area is a little bit less productive than Newcastle because there aren’t as many people, but the ward here is amazing all of the members are focused on missionary work. just yesterday we had the opportunity to go out caroling it was awesome we went around to non member homes and after we sung the ward mission leader brother brooks invited them to learn about the gospel. Christmas time is the best time to share a message about Jesus Christ. We have a baptism coming up on Saturday. His name is Amul, he is an Indian fellow. We are also teaching a lady that is 81 years old, and she should get baptized by the end of the year. Grandma brown and the entire family is always in my prayers. This last week I’ve had the feeling that something wasn’t right, and now I know what it is. I just kept thinking about Sterling and Teresa for no real reason. Thank you so much for your encouragement it helps me so much and I am so thankful for you as a dad. Let me know how Grambo's health is going. I love you so much your awesome. I’ll have more to report next week. I miss you too, and the work here is going good as well. Have you had the opportunity to save up money for a car...? I love my mission so much. I love Richmond, but I miss Newcastle. My companion, Elder Bennett, is kind of a nerd, but he is awesome. No problem, I am happy to let you use the room. You are so awesome. I love my new companion. 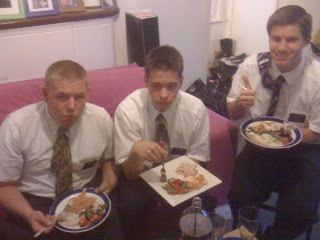 He is kind of a nerd, but I love him... Well I guess I have to...:( His name is elder Bennett. I think he might like math class as well...You guys would make an awesome couple seeing how you are both nerds. Just think, all you have to do is wait for a year and everything will be ok. You wont have to worry about it anymore. You’re awesome! I love you tons. This week was probably the hardest week so far in my mission. Mainly because we had so many appointments fall through. Ya, it's way cool that there are other missionaries they actually stay in the same flat (a flat is a house here) lol. I'm not a senior companion, but I basically am. My companion has been out for a year, but I still am the one that plans our days and calls the members. So ya, I basically am, but he has been out longer!!! We actually had a baptism on Saturday. 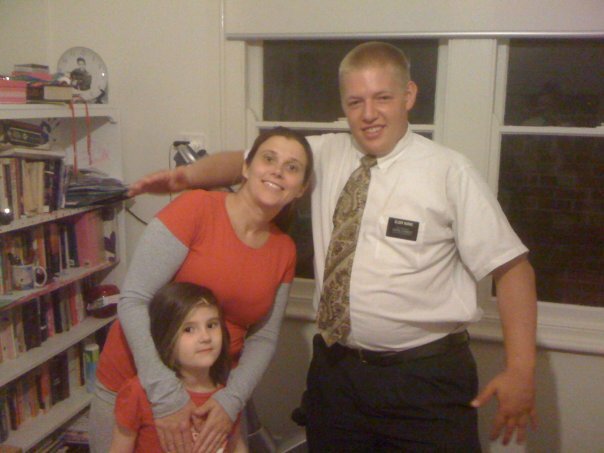 Elder Lord baptized him. His name is Michael Badier. Michael was a miracle baptism. It was amazing how we ran into him. We where walking out of an appointment and we walked past him and he said "hey elders." It caught us a little off guard, so we talked to him for a while and found out that he had been taught by the missionaries a few years back. Also we found out that he has read the book of mormon 4 times, and he knows it's true. He had already had a baptismal date in the past. What set him back was his smoking, so we helped him quit. 3 weeks after we met him, he was baptized. We're working with a few people right now, but nothing is really moving forward at this time, but we will come back. One really awesome thing we are doing is teaching this family from Laos. The dad's name is DONE, the mom's name is AT. There are 4 girls, the oldest - she is 15, her name is DAN-MALA. PHOUTMALLA, age 13, DONA SETE, age 11, and UMALA, age 7. They are so sweet. Phoutmalla made me and Elder Lord Christmas cards, and she drew pictures and stuff - it was so cute. The only problem we have with them is they have no car, and its hard to find a ride for 6 people lol, but we are trying. Ya, we set goals as a companionship every day. Our goal for the year for baptisms in the mission is 252, right now we are at 215, which is awesome, but it's still far away. We work with members every day to get them to appointments and to fellowship. Well, I love you tons! These photos were provided by Sister Shireen Sills from Newcastle, Australia. She and Michael Gould were kind enough to have the Elders over for Thanksgiving dinner. Thanks!